Scientists have looked deep within the pages of this ancient text, all without physically opening it at all. An ancient Dead Sea Scroll dating back 1,700 years has been unwrapped virtually in an incredible process that allows scientists to peer at the pages within without damaging the precious artifact. 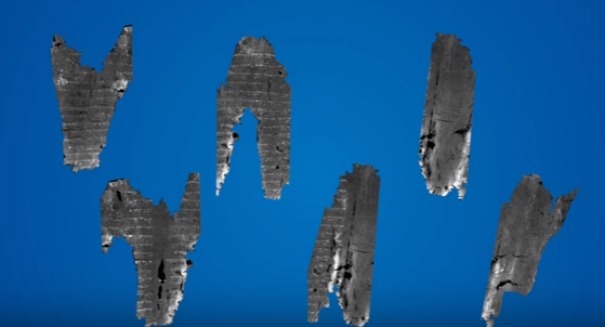 This En-Gedi scroll, which includes part of the Book of Leviticus from the Bible and was damaged in a fire 1,400 years ago, can now be ready by scienitsts thanks to a process called “virtual unwrapping,” according to a University of Kentucky statement. Actually unwrapping the scroll would have destroyed the crumbling piece of script. By using this process to digitally scan the document, and then virtually flatten the results, scholars can now actually read it, which they never would have been able to do years ago. It’s probably the first time that scroll has been run in millennia, and many thought it was impossible to ever read. The scroll was found in En-Gedi in 1970. A fire destroyed this site in about A.D. 600, experts believe. It housed a synagogue which had a Holy Ark, which itself contained the Torah scrolls. This scroll is different from the Dead Sea scrolls, which were found in a cave in the Judean Desert in 1947, but many people use the Dead Sea Scroll has an overarching term to refer to any ancient scrolls in the area, as well as this one. “This work opens a new window through which we can look back through time by reading materials that were thought lost through damage and decay,” said Seales, who is professor and chair of the UK Department of Computer Science. “There are so many other unique and exciting materials that may yet give up their secrets — we are only beginning to discover what they may hold. “We are releasing all our data for the scroll from En-Gedi: the scans, our geometric analysis, the final texture. We think that the scholarly community will have interest in the data and the process as well as our results,” he said.